I think they picture an elaborate multicolor filing system where I keep printouts of our schedules and information. Not exactly. By color coding, I mean I just assigned a color to each member in the family. Thankfully, everyone already had different favorite colors so each person got to have their favorite color. Then, slowly, those colors identified them and their belongings throughout our home. Below I’ve broken down where in our home we use the color coding system and why. I started color coding our family on our calendar. I wanted to easily see who had activities on any given day. The easiest way to do this (for me) was to assign each family member a color and to write in all of their events in that color on the calendar. Over the years, I’ve used a variety of calendars. These three were my favorites because each of them had plenty of room to track all of our activities. Then, you just need to buy colored pens so you can use a different ink color for each family member. Whether you like to write in ballpoint, gel ink or marker, you have plenty of options! Over time, I moved from a paper wall calendar to a dry erase version. I liked the improved visibility since it was posted prominently on the refrigerator. This made it impossible to avoid so I was far less likely to forget important tasks or events. Thankfully, it’s very easy to find multicolor dry erase marker sets, so it was easy to transition to this new system. Once I had more than one child in high school and our weeks became REALLY busy, we switched to a weekly planner. We stuck with the dry erase, refrigerator version since the visibility was still just as important. In our family command center, I also posted a wall mounted file holder. Each family member had a folder in the same color as their ink color on the calendar. The colored folders are where we would keep important papers from school (e.g. field trip forms and reading logs), birthday party invitations, etc. This made it much easier to keep track of those items! Perhaps because our color coded planning system lived in the kitchen, this was the first area my color coding habit extended. Furious over the 20 dirty glasses and cups filling up the kitchen sink, I was desperate to find a way to get my family of seven to limit themselves to sever dirty glasses each day. A quick glance at our color coded calendar was the spark that lit the fire. Within minutes, I was online ordering colored drinking glasses from Amazon. A few important notes if you decide to implement the color coded drinkware system in your home. First, make sure you order at least two of each color so that when one is in the dishwasher, each person has a clean cup/glass to use. Second, plan for guests. Either order a set with more colors than you have family members so that the extra colors can be used for guests. Or, keep a separate set in a different style that you can use for guests. Once you realize how effective the color coding system is at reducing the number of cups and glasses you wash each day, you’ll probably want to invest in colored plates and bowls too. Really, I only found this effective when you have younger kids. When your kids are teens (and older), they tend to snack right out of the fridge or pantry, bypassing plates and bowls completely. That’s why I’m only showing kids plates and bowls below. Once the kids were used to claiming their own colors in the kitchen, I realized that color-coding our bathroom could eliminate some problems as well. I bought the kids towels in their colors we’d already assigned for the calendar and kitchen. Like the drinking glasses, all of a sudden, towels could now be used more than once! Turns out the same kids I have to remind to wash their hands and clean up after themselves are completely germaphobic when it came to drinking from someone else’s glass or drying with someone else’s towel. If your kids share a bathroom and you don’t want to spring for character toothbrushes, you can extend the color coding system to their toothbrushes too! When you’re traveling, this makes it really easy to spot at a glance which of your kids forgot to pack their toothbrush so you only have to send one child scurrying off to retrieve it from the bathroom before you leave. Color coding the towels cut back on laundry significantly since the kids were reusing their towels, but I still had laundry woes. It was virtually impossible for me to tell some of the kids clothes apart. When they were younger, it was mostly socks that got mixed up since the boys wore the same brand. But as my kids grew and were wearing similar sizes to each other and my husband, everyone’s clothes were getting mixed up! By investing in colored hampers and mesh laundry bags (for smaller items and delicates), it became far easier to keep each person’s items separate. And ultimately, this led to the transition to each of my kids doing their own laundry! Over the years I’ve tried a lot of organizing systems using various bins and baskets, trying to contain the clutter that is a natural part of family life. The shoe bin would always overfill eventually so that shoes were strewn all about the floor around the bin. Toys, electronics, gloves, hats, books, etc. would take over any containment method I tried. And of course, all of the kids blamed their siblings for the bulk of the clutter. Color coding our storage system helped eliminate a lot of these problems. Since each person had a similar-sized storage container, no one could claim more storage space. Even better, since each child has his or her own bins, they take better care of the items within them because apparently, kids only care about their own stuff. 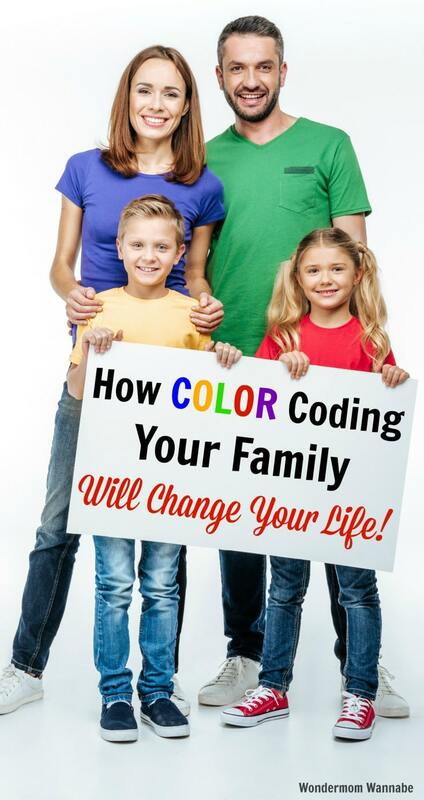 If you want to get the biggest benefits when you color code your family, you can probably get away with skipping the kitchen, bathroom and laundry. But don’t skip the calendar system or the storage bins. These are the areas you’ll notice the biggest difference. The areas I’ve mentioned above were the places I believe color coding made the biggest impact on my family. Once you get bitten by the color coding bug though, you might find yourself trying to color code everything! Better yet, you can color code ANYTHING by using labels, tape, or carabiners. Just attach the right color to any item you choose! 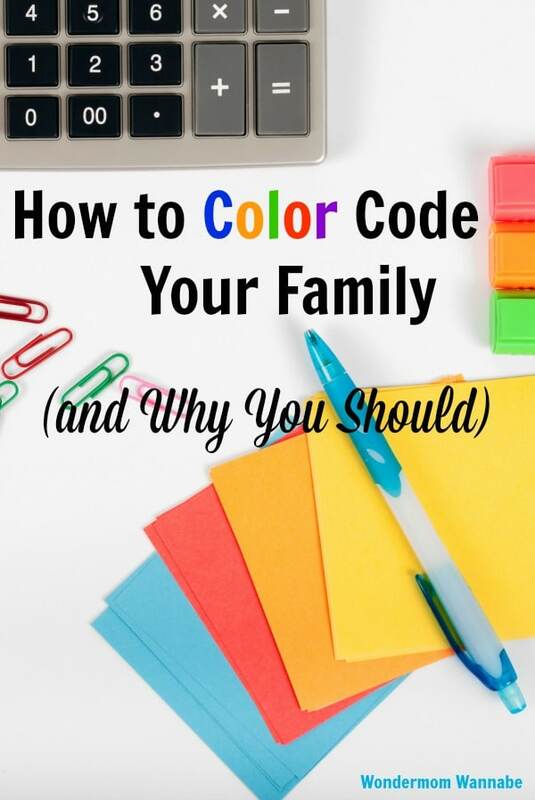 If you’ve already used color coding with your family, I’d love for you to share your own tips and ideas in the comments! great article! what i must have right now is some sort of color coding system for folded clothing that don’t go on hangers. Would be great to locate a device that can sew or soft-staple on a dot of color to the clothing for differentiation. Any ideas?? I love color coding! Now that my children are all on their own l still use the system & assign a color to family, Church, appointments, projects etc. I can tell at a glance what l have going on that day. Great idea, unless you happen to be color blind like I am! It is a more common problem than most people realize. I am female, so it is not an inherited problem. It comes from a disease I have been cursed with since childhood, Multiple Sclerosis. It runs in my mother’s side of the family.